Today, more and more people choose to watch videos on computer or portable devices instead of on TV. Due to the natural limitation of portable device, it’s not so easy to watch Blu-ray movies on portable players like iPad (unless you rip and convert it to supported video formats). But as long as you have a Blu-ray drive, you can watch Blu-ray disc movie on Windows 10/8.1/8/7/Vista/XP computer. 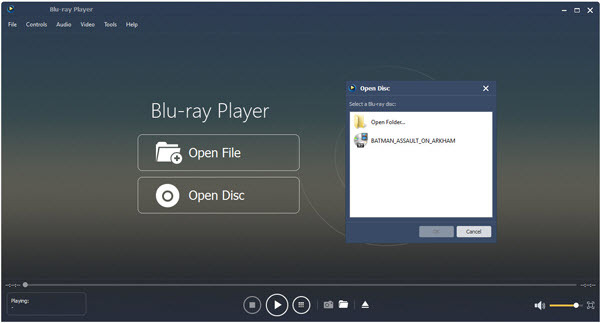 Or if you have copied the Blu-ray disc and saved on your local disc as Blu-ray folder or ISO image file, you can also enjoy Blu-ray movies on your computer. All you need is a professional and easy to use Blu-ray Player Software – Aiseesoft Blu-ray Player. Aiseesoft Windows 10 Blu-ray Player is a powerful player that could play Blu-ray disc, Blu-ray folder, Blu-ray ISO file and common media files and videos smoothly. You are able to play any Blu-ray disc/ISO files directly with 4k/1080p HD visual effect and play H.265/HEVC encoding 4K video files losslessly on Windows 10/8.1/8/7/Vista/XP PC. What’s more, this Aiseesoft Blu-ray Player also acts as a common media player for any HD/SD video files and you are able to enjoy the immersive audio effect. Aiseesoft Blu-ray Player is able to play any commercial Blu-ray disc released in any region. Meanwhile, it supports the newly released Blu-ray movies and lets you enjoy lifelike, vivid visuals and crystal-clear details with full 4k uhd or high definition 1080p resolution when playing Blu-ray disc. This Blu-ray Player software also supports full UHD 4K Blu-ray playback or HD 1080p Blu-ray disc playback. You can build an incredible home theater and enjoy Blu-ray feast with the Blu-ray Player software, a computer and a full HD home theater projector. If you have made a copy of Blu-ray folder or Blu-ray ISO file on your local disc, you can load it to the program and soon you will be able to watch the movies. The whole process can be finished within a few clicks. 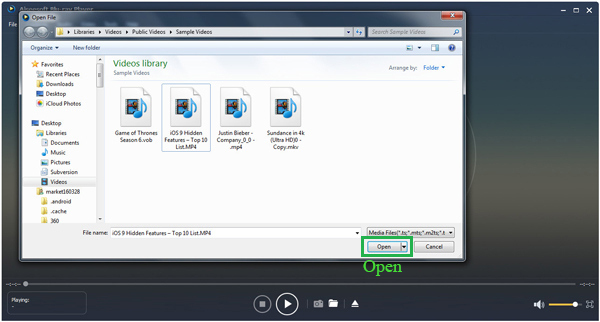 Except the Blu-ray playing function, it also acts as a free powerful video player program to play non-Blu-ray video. Any video formats, such as MP4, H.264/MP4 AVC, H.265/HEVC, MPG, M4V, TS, MTS, M2TS, MXF, RM, RMVB, WMV, ASF, MKV, AVI, 3GP, F4V, FLV and VOB are highly supported. 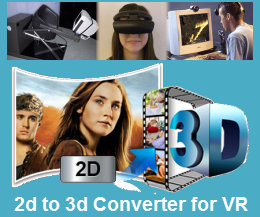 You can also use it as a free 4K/HD video player as it supports playing 4K videos in MP4, H.264/MPEG-4 AVC, H.265/HEVC, TS, MKV, AVI, MOV, FLV and WebM formats. With this amazing player, you could get wonderful HD video watching experience and fully enjoy the HD entertainment on Blu-ray disc whether it’s DTS-HD Master Audio or Dolby TrueHD. With 100 percent lossless audio and dramatic high-definition (HD) surround sound, this Blu-ray Player software ensures you hear every nuance of Blu-ray movies without any loss of quality. * Choosable audio track and subtitle provide you much convenience. * Super-fast loading speed to play Blu-ray disc especially when you connect to internet. * Multiple parameter settings allow you to customize the playing effect as you like. How to Play Blu-ray Disc, Blu-ray Folder(BDMV) or Blu-ray ISO on Windows 10/8.1/8/7/Vista/XP PC? 1. Download and install Aiseesoft Blu-ray Player on your computer. You should make sure that a virtual drive should be installed on your computer. 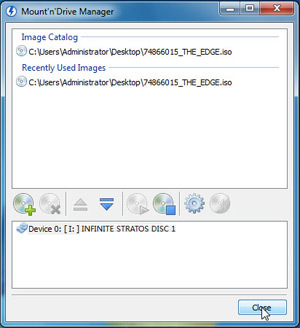 Launch the virtual drive and load the ISO file, then you can operate the same way as playing Blu–ray disc. Best Blu-ray Player for Mac-Playing Blu-ray, DVD Movies, ISO, Folder, HD, etc. Great! Worked perfectly first time on Win 10. No malware detected.